In attempts to portray the Iraqis as anti-American and to terrorize the Jews, the Zionists planted bombs in the U.S. Information Service library and in synagogues. Soon leaflets began to appear urging Jews to flee to Israel. . . Although the Iraqi police later provided our embassy with evidence to show that the synagogue and library bombings, as well as the anti-Jewish and anti-American leaflet campaigns, had been the work of an underground Zionist organization, most of the world believed reports that Arab terrorism had motivated the flight of the Iraqi Jews whom the Zionists had “rescued” really just in order to increase Israel’s Jewish population. 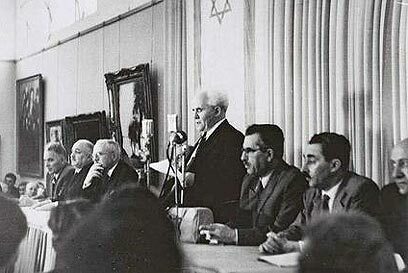 In 1955, for example, I organized in Israel a panel of Jewish attorneys of Iraqi origin to handle claims of Iraqi Jews who still had property in Iraq. One well known attorney, who asked that I not give his name, confided in me that the laboratory tests in Iraq had confirmed that the anti-American leaflets found at the American Cultural Center bombing were typed on the same typewriter and duplicated on the same stenciling machine as the leaflets distributed by the Zionist movement just before the April 8th bombing. Zionists backing of overtly neo-Nazi manifestations has been a means of generating feelings of insecurity within “Diaspora Jewry” in the all-too-peaceful Western world. Here are several dramatic examples. The National Renaissance Party (NRP) was one of the first “neo-Nazi” groups to emerge after World War II and one of the longest enduring (1949-1979). It ended only with the death of its leader, James H Madole. “Coincidentally” whilst there was this flurry of international activity among journalists, communists and Zionists in response to the incidents in Germany, on January 26, 1960 three youths were jailed in New York after having allegedly shouted “Heil Hitler” at a rabbi, after the rabbi had approached the boys following a communist meeting protesting against the supposed resurgence of German anti-Semitism. Ten days earlier three other youths had been arrested in New York for organizing a “neo-Nazi club.” They were charged with disorderedly conduct, amidst demands by the prosecutor that they should be charged with “treason,” with the possibility of a death penalty. The leader of the three “traitors” was a member of the National Renaissance Party, as were all three of those arrested on the 26th. The NRP had its origins in a one-man effort by James Madole, which he called the Animist Party. Madole was contacted by Vladimir Stepankowsky, who offered to fund Madole. Stepankowsky put Madole in contact with others, and meetings were held in Stepankowsky’s hotel in New York. Stepankowsky prepared Animist Party literature with an anti-Semitic emphasis. Stepankowsky then organized a conference between the Animist Party and other anti-Communists. Stepankowsky even gained contact with three anti-Communist Congressmen, who were duly implicated in a “fascist plot” when the convention was exposed by the Anti-Defamation League (ADL). Stepankowsky, the real founder of the NRP, America’s first and longest running “neo-Nazi” group, was both a long-time communist agent and an agent for the Anti-Defamation League (ADL). Kamp reveals that Stepankowsky was a prominent veteran Marxist who had edited a communist newspaper in London in 1905. In 1917, he was jailed with communist revolutionary leader Trotsky in Russia. He was later deported from England for communist activities. In 1933 he was identified as a Soviet agent by the French Ministry of War and deported to Switzerland. There he became the head of what the Swiss secret service called the “Bolshevik Information Bureau” and was deported to Italy. He entered the USA illegally in 1936. In the USA, while writing for communist papers, he was employed by the ADL in 1937. In 1954, ex-Soviet spy Elizabeth Bentley exposed him as a Soviet agent. However, because he had influential friends via his association with the ADL, no action was taken.